Play with meteoroids in this space physics game. New level added to make the game more interesting. Simulate energy production, work with magnets and collect pearls to fill the bucket. Accurately drop 10 pearls into the bucket to go to the next level. The game is about relationship between various forces like electric, magnetic, elastic, potential etc. 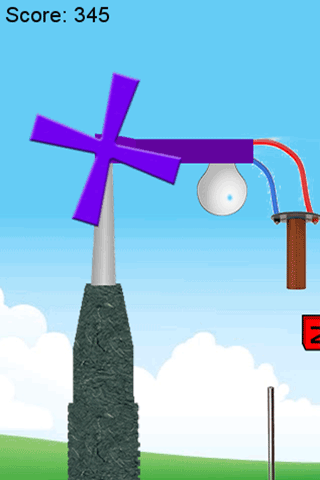 In the game, moving the windmill creates a “chain reaction” bulbs light, magnets move. Swipe the left side of the windmill, to make it rotate and produce electricity. Eventually, the door on the right will open, releasing a ball. Swipe on the elastic bar at the bottom (just like a slingshot ). Pulling the bar determines the angle and speed of the projectile that you should aim at the birds carrying the pearls. Pull the bar to the left. Hit the birds, collect the pearls into the bucket, and you are good to go.